"Les Soldes" - Winter and Summer Sales in Paris are a real event for the city ! Department stores, boutiques, designer outlets clear out items from the previous season. The first days are frenzy and most of Parisian women take time to shop the days before the official start dates to select what they intend to buy then. If you plan to shop during sales in Paris be prepared for long days ! Summer sales start late June and ends early August while Winter sales start early or mid January and ends mid February... Sales are state-regulated in France and every year the start dates change. Where to shop ? Where to find the best deals ? What are the best districts or streets to go to during winter or summer sales ? Here is our selection of the best places to shop depending on your time and your interest. Luxury boutiques and Haute couture fashion : The two best districts are the Faubourg Saint-Honoré close to Louvre Museum or Champs Elysees and Montaigne Avenue. In these two locations are set the most famous brands and world renowned fashion names. However it may not be the best places to shop if you are looking for bargains. Department Stores - Galeries Lafayette and Printemps & Madeleine : The best places if you have no time as they gather a large collection of brands (Clothes, perfume, cosmetics, ...). More details below. On the Place de la Madeleine also find Hediard and Fauchon, two very reputated grocery stores and the Maison du Chocolat (Chocolate House) a few steps away. Le Marais, Saint Paul Village and Bastille : Also try these districts for young fashion designers (Le Marais) and antiques or fine arts (Saint Paul Village and Boulevard Saint Antoine close to Bastille). Best streets to shop in Paris : Rue du Faubourg Saint-Honoré, Rue Saint-Honoré, Rue de la Paix, Place Vendome, Haussmann Boulevard, Saint Germain Boulevard, Rue de Sevres, Rue de Rennes, Rue des Francs Bourgeois, Rue de Turenne, Rue des Rosiers, Champs Elysees Avenue, Montaigne Avenue, Place de la Madeleine and Rue Tronchet, Boulevard Saint Antoine. Paris-city-tour.com is a online reservation website dedicated to sightseeing and tours - We also offer an airport transfer service from either Roissy, Orly or Beauvais airport. Either looking for entrance tickets for a cabaret like Moulin Rouge, Lido or Crazy Horse, a romantic place to dine, a visit to Monet House in Giverny, a Versailles castle full day guided visit or a private transfer to Disneyland ... you will find it on our website. 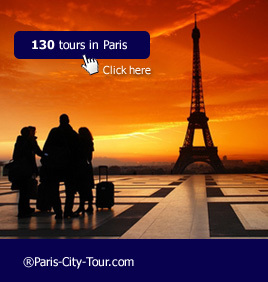 This page features information about Winter and summer discount sales period in Paris.